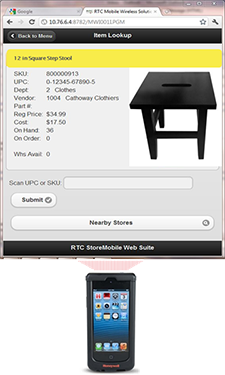 RTC is the Only Vendor Mobilizing MMS - StoreMobile INV | RTC Group, Inc.
Is your staff spending countless hours off the sales floor doing inventory control procedures instead of helping customers? Imagine performing traditional back office functions such as: inventory counts, receiving, transfers or item look ups real-time into JDA® Merchandise Management System® (MMS®), from a simple handheld device or tablet, without leaving the sales floor. RTC "The MD of Retail IT" brings you StoreMobile INV, the answer for retailers looking for increased mobility in managing their JDA® MMS® operations. This powerful wireless solution is designed to allow JDA® MMS® users to improve their operational work flow while viewing, collecting and managing key information real-time to JDA® MMS®, from anywhere in the store, saving them time and money. JDA and MMS are trademarks or registered trademarks of JDA Software Group. Systems design, construction, integration, implementation, and consulting expertise. All designed to ensure optimal operation and systems processes.